With this book in the Kids Can Do It series, kids can knit some crazy cuffs to jazz up jeans, jackets, sweaters or hats. Make a cool drawstring backpack to hold your gear. 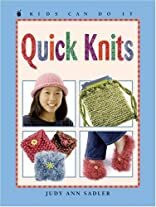 Use big needles and thick yarn to knit these and many other projects yourself -- and get speedy results! Beginning knitters will find all the directions they need, and experienced knitters will be inspired to try something new. You'll want to knit up a few of each in different colors, and make some for your friends, too. So what are you waiting for? Knit now!